Bali is also blessed with a beautiful nature. Endless sand beaches envelope most of Bali's shores, where silvery waves come home to. Tall cliffs border the eastern shores. Volcanic mountains crown the center of Bali, home to Gunung Agung (Mount Divine), the sacred abode of the gods and the goddesses. Green forests stretch on from east to west of the northern part of Bali, nurturing numerous flora and fauna that can only be found here. The beaches of Bali are, in one word, magnificent! From the stretch of sand in Kuta, fenced far in the South by the runway of Denpasar International Airport; the peaceful elegance of Nusa Dua; the mysterious quietness and somberness of Candidasa, as a temple dedicated to the sea goddess submerges; to the spectacular sunsets of Lovina in the North. The beaches of Bali readily accept the arrival of the waves, time and time again. And they vary. In the stretch of Nusa Dua alone you can find soft waves for the beginner surfers to the wildest of waves that will challenge even the most experienced of the surfers. Yeh Saneh in the East, Uluwatu in the South, and Medewi slightly to the West, are all excellent site for waves. 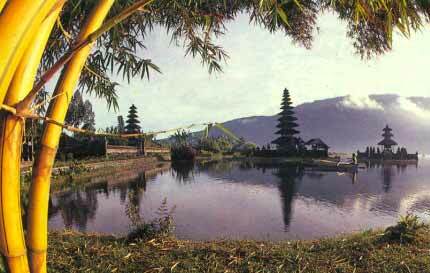 There are four lakes in Bali. Lake Batur, the old crater of Mount Batur, is the largest. Kintamani offers an excellent panoramic view of the lake, and the lake itself effectively fences in the Bali Aga people in Trunyan. Lake Bratan, the second largest, is near the town of Bedugul. Lake Buyan and Lake Temblingan are also near. When the heat and humidity gets to you, why not escape to Bedugul. Bali's highland retreat tucked into the crater of an extinct volcano 1400 metres above sea level. Here three lakes provide everything from recreation to the water for springs, rivers and rice fields below. Lush pine forests seem to create a freshness in the air. Bedugul is known for the quality of its fruit, vegetables and flowers. The spectacular mountainous region around Kintamani with its deep crater lake and bubbling hot springs, make this region a must to visit. Lake Batur is the largest lake in Bali and the region offers some of the most spectacular views to be found anywhere on the island. Lake Batur also provides water for an underground network of streams and springs across the southern slopes of the mountain. The district is the earliest known kingdom in Bali, dating from the tenth century. The evenings get cool up here but it's well worth the stay overnight to climb the volcano and watch the sunrise. Many cheap losmens are available here. The string of volcanic mountains crown the Northern part of Bali. The tallest is Gunung Agung (or Mount Divine), the abode of the gods and the goddesses. The wild forests of Bali can be found mostly in the Bali Barat National Park, dedicated to the preservation of wildlife. And the tropical climate of Bali endows it with a rich flora. 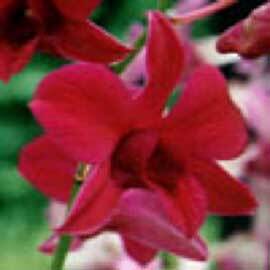 In the forests, tall tropical trees reach for the sky, nursing a variety of wild orchids to grow on their branches. Pine trees carpet the mountains. Ever protective, waringin trees faithfully stand at the center of every village. Flowers beautifully punctuate little gardens in every house, and most importantly, spreading their sweet fragrance into the midnight air and completing offerings to the gods and goddesses. Bali tigers (Panthera tigris balica ) used to roam these forests, but now you can only find deer or wild boars. Bali Barat National Park is also reestablished as the new habitat for Bali Starling (Jalak Bali), a sweet, white bird that has inspired many a painter. Sea turtles, another protected species, can playfully accompany you when you go snorkeling in the the waters of Nusa Dua.